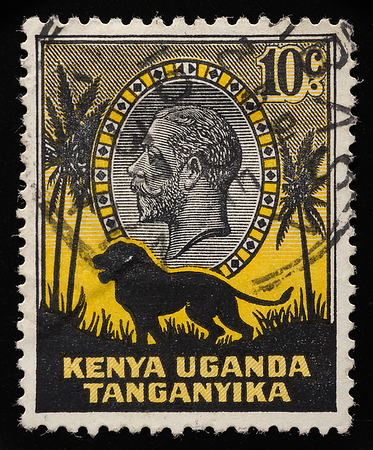 Affinities with Africa continued after the Zanzibar definitives, in a Kenya, Uganda and Tanganyika (KUT) design. The two designs were actually born at around the same time. In 1934, while the essays for the Malayan stamps were being produced, a stamp design competition was held for the KUT definitives (Coulton 2001). The design by A. Ross (Edward Mosely comm.) took the prize. Besides the obvious resemblances, both designs carry a subtle feature: the background sunset shading. I cannot help but wonder if De La Rue introduced this refinement across the continents, since both issues were contracted to them. 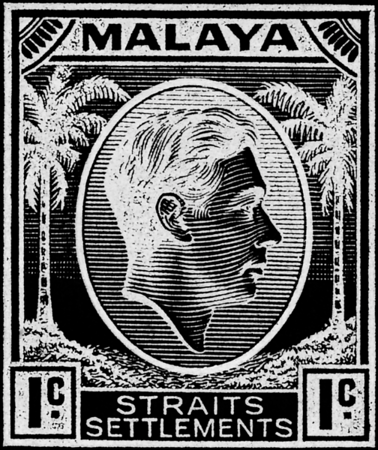 We know for sure that De La Rue added the sunset to the Malayan design, since the essays had not been so "lighted". The KUT definitive presents itself as a more flamboyant cousin of the coconut definitive. 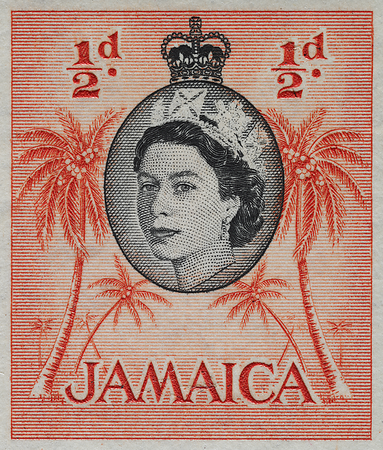 The heavy lion, bold letter strokes and loudly decorated medallion frame give it a hint of Art Deco, a style characterized by bold colours and bold geometry that is much less common on the stamps of the British Empire than on those of continental Europe and Latin America. The design could have been inspired by artwork of the type shown on this trade card. 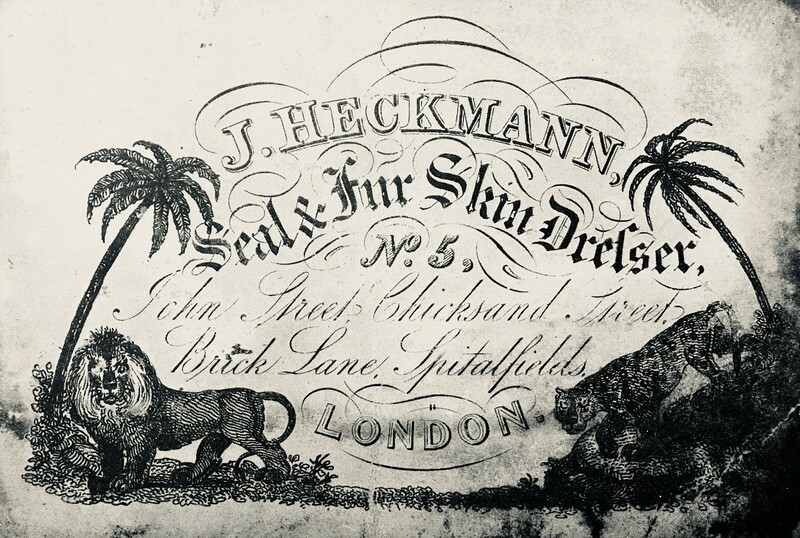 It belonged to a furs-and-seal-skins dealer that was in business since at least the first half of the 19th century (The London Gazette), although the date of the artwork itself is unknown. The London address is embellished with a scene from Africa, with African big cats and coconut palms. I don't like the KUT design very much. The palms, having fronds that are too thick and straight, are less realistic than those in the Malayan design. 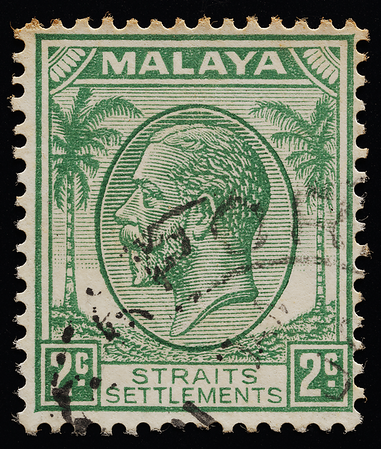 Their leaning trunks and asymmetric heights also make them more pictorial than architectural, giving the stamp a less commanding disposition than the Malaya issues. Furthermore, the oval seems too long for the proportions of the king's bust. Some, however, prefer the KUT design over the Malaya one, citing the former's striking colours and stronger pictorial narrative through the presence of more trees and the lion among other landscape elements. But it was in a Portuguese colony immediately to the south that the bicoconut format was combined with full pictorialism. 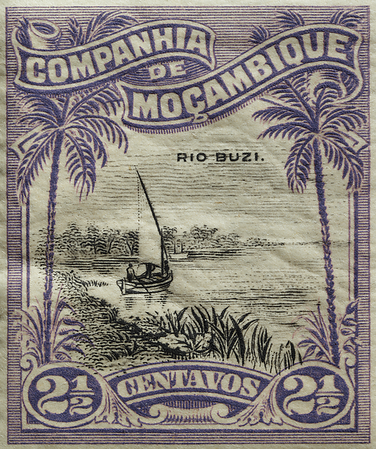 Here the Mozambique Company controlled two provinces including the post offices. Its 1918 artwork takes you to the placid waters of the Buzi River. But behind the veil of tranquility was a hellhole of slavery and rebellion. On the opposite coast of Africa, in Nigeria, arose yet another bicoconut design (left). It was born in the wake of the ascension of King George VI. This opus by Bradbury Wilkinson & Company is strikingly similar to De La Rue's Malaya, especially when luminance is inverted (right). Perhaps this had something to do with the fact that they were printed using methods that were the reverse of each other—intaglio and letterpress. But for them to be so similar, it seems that one must have copied the other. These are the only two bicoconuts I have seen that are not cluttered by any other animal or foliage. I prefer the Malayan coconut definitive. For one thing, the Nigerian design does not have De La Rue's sunset lighting. The dark and uniform background, with the tree trunks rising abruptly from the denomination tablets with no soil, reminds me of spotlighted artificial palms at dinner parties. The palms lack contrast, although this could be perceived favourably as having the softspoken tones of Art Noveau (see Suriname design below). A strange feature in the Nigeria design is that one of the trunks is straight while the other is bent. To my knowledge, this has never been reported. Could the engraver have misjudged the position of the foot of the trunk as he started carving it, and decided to curve the tree around the vignette instead of trashing the whole die? Could it have had something to do with the asymmetry of right or left-handedness? Or were the trees carved by different engravers? We may never know. 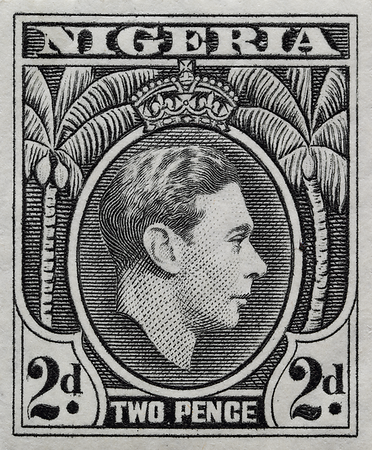 Fellow philatelists have suggested that the palm was possibly bent in deference to the king. But this would seem comical to the author, reminding him of a Tom & Jerry or Donald Duck cartoon, or of the king pulling off a feat of telepathic kung fu. Meanwhile, in the 1930s, the Cayman Islands had their own Realist bicoconuts starting with this elongated design. A huge crown makes it top-heavy, while identical and relatively unremarkable conch shells—each almost as large as the king’s head—occupy the spaces where one would expect to see the denomination. The coconut palms feel "smaller than life". 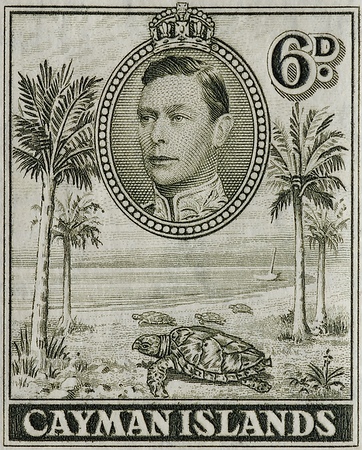 In 1938, one of the denominations of the Cayman Islands KGVI definitives again featured two coconut palms flanking the scene. It was even more awkward this time. The king's portrait is stuck between the leaves, high above the beach, and the palms can't "sway in the wind". The palms are probably a different variety from the Malayan ones. The neighbouring island of Jamaica in the Caribbean Sea seemed to have been influenced by the Cayman's tree-top portrait and extra pairs of smaller palms. But when Jamaica issued its version in 1956, the palms had been fixed. They now looked more natural, complete with slanting trunks seemingly swaying in the sea breeze. But there's something even more impressive. Like the Malaya issue, the designer effectively portrayed the coconut palms as structural elements supporting the monarch's vignette while retaining their botanical realism. Alas, the coconuts appeared on only the lowest denomination in the whole set. The Dutch produced their own bicoconut for their colonies too. This Queen Wilhelmina definitive (1913–1938) was designed by Jan Veth, engraved by D. Harting and printed by Joh. Enschedé (Schiller & de Kruyf 1940, Riddell 1970). But botanical illustration apparently wasn't their forte. If the palms on the Malayan definitive are flimsy, as Easton reckoned (Halewood 2007), the ones on this stamp are much worse. They are spindly even by coconut standards, and one frond on each palm is awkwardly pushed out of position by the vignette. The trunks are shaded with vertical lines, which are erroneous from a botanical perspective. The trunks are also uncomfortably squashed against the vignette, perhaps to make space for the fronds. Distant mountains are a nice touch, but there's a lot of dead space at the top and bottom of the stamp, filled in by heavy Greco-Roman slabs and generic texturing. It lacks local flavour, and the tallish aspect ratio doesn't help—see discussion of ratios. 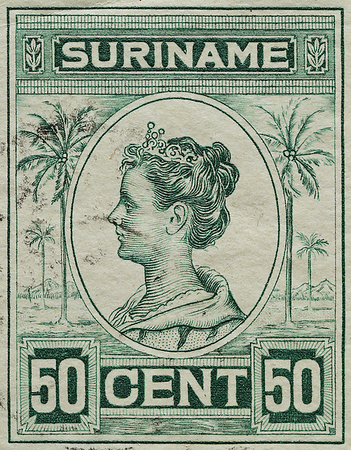 The design was used in the Netherlands East and West (Suriname and Curaçao) Indies. It boasts the distinction of being the most well-travelled bicoconut, having voyaged east across the Eurasian landmass and west across the Atlantic from its birthplace in Europe. 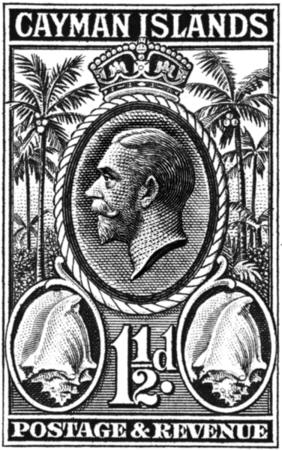 As fate would have it, the great war brought the Malayan coconuts to the Netherlands East Indies, whence they became the new envelope gems and assured the supremacy of the De La Rue design in the Far East. 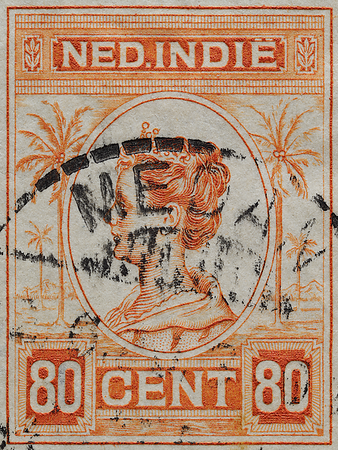 In my opinion, the Dutch had greater success with coconut stamps in the West Indies. This 1927 Queen Wilhelmina exudes stylistic unity, being distinctively Art Noveau in the graceful curves of botanical morphologies. It was designed, engraved and printed by Enschedé (Riddell 1970). The queen's portrait was based on a photograph by H. Deutmann of The Hague (Riddell 1970). One can't really blame the palm fronds for aspiring to more luxuriance than in real life. Unlike the Malayan coconuts, the design is finely recess-engraved with low contrast. This goes well with the placid character of Art Noveau. It would seem that bicoconut stamp designs were as cosmopolitan as the real plant. But in the end, the track record of Malaya's coconut definitive speaks for itself. The African, Caribbean and Dutch designs never attained the kind of universality and longevity enjoyed by the Malayan design. I am grateful to Tony Plumbe and Tash Kreditanstalt for discussions that improved this article. Almost an afterthought: the coconut palm as a space-filler? 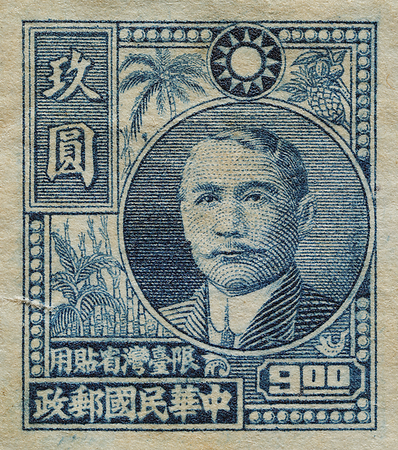 Dr Sun Yat-sen, Taiwan 1947.